Ideal for use on textured surfaces such as wood, card, fired porcelain, ceramic, the Da Vinci Mottler Forte Brush is perfect for decorative art techniques. What is a mottler brush? 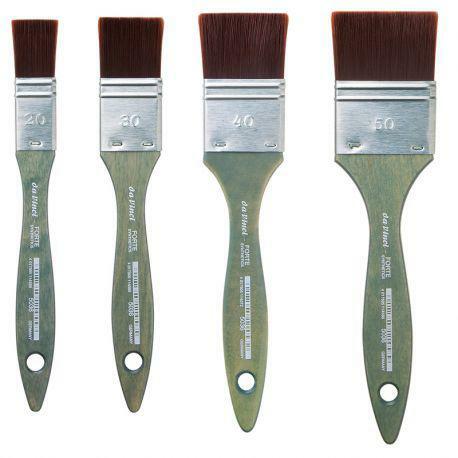 Used for faux finishing techniques, murals, washes, varnishing and priming, a mottler brush provides good coverage due to its capacity for holding large amounts of paint. A large, flat brush, a mottler can have long or short bristles, formed from natural hair or synthetic fibres. Why use a Da Vinci Mottler Forte Brush 5036? Available in sizes: 20, 30, 40, 50, 60 and 80 mm, there is a Da Vinci Mottler Forte Brush to meet the requirements of all artists and crafters. How should I care for my Da Vinci Mottler Forte Brush? The methods for cleaning brushes differ, depending on the type of paint used. Brushes used to apply water-based colour may be cleaned simply with soap and water. To help preserve the condition of the bristles, a specialist brush cleaner may also be used. 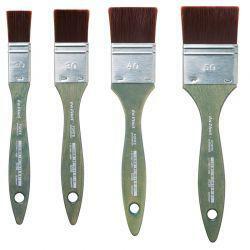 What are the best paints to use with a Da Vinci Mottler Forte Brush? Suitable for use with all media, the Da Vinci Mottler Forte Brush is ideal for applying gouache, acrylic and watercolour paint. Owned by the German company Defet, the Da Vinci brand was patented in 1952. The company’s philosophy to use only the best materials, traditional craftsmanship, and technological progress ensures Da Vinci brushes are of the highest quality. these are the best brushes I have ever used, one reason: they are indestructible even when I wash them with caustic soda or cellulose thinner. They are simply the best for acrylic, I cannot think of a better product!